Deb hosts Friday 5+ about school and asks, It’s Back-to-School time! Are you that “A+ Student for life” or the King/Queen of Detention? RevGals want to know! We are all still learning (or re-learning) some kind of lessons! 1. Reading: what’s in your “to-be-read” stack? 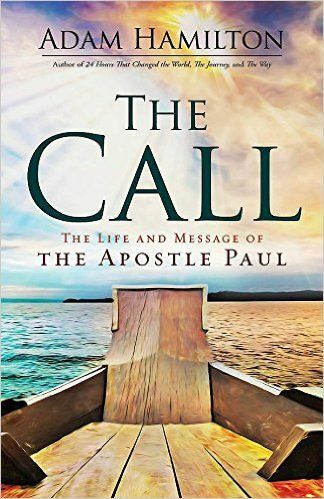 Although I love Love LOVE ideas, I'm not much of a reader, but as an Amazon Viner I was ecstatic to get The Call: The Life and Message of the Apostle Paul by Adam Hamilton to review. So far I've read only two chapters, and as usual, I love Hamilton's practical scholarship and his attention to real life applications. Blog-related: I recently went through my entire 13-year old blog to be sure all book reviews had current amazon links and a cover image; to be sure all links were live and opened in a new window/tab, which meant antiquated asp and php pages had died, and some of them didn't have an automatic redirect to their current page or site. Because this is the 2nd decade of this century I made sure all images were large rather than thumbnails, because you know everyone has broadband. What am I writing? Blogs: I've been doing Kate Montaung's Five Minute Fridays; I've been paper journaling some at the coffee shop, snack shop, and sandwich shop. 3. ‘Rithmetic: Family budget? Church budget? National debt? Trying to keep afloat and also deal with the fact I still get a monthly paper bill / invoice / statement from the last entity my mortgage note went to, in spite of wisely and necessarily having gone through foreclosure during November 2013. My style with this one is also known as Head In The Sand. Between the County, HOA, and mortgage, I owe an amount close to the National Debt. My financial adviser, friend and former neighbor's Dad who's a title expert, told me that entity had "no legal authority to foreclose." 4. Music: favorite new hymn or worship band? Still listening to a lot of Mary Chapin Carpenter! Since migrating up this way a couple months ago, both churches I've attended – PCUSA and ELCA – have exceptionally excellent, though very traditional music and liturgy. I want a bit of rocking praise, some music with a bit of edgy excitement and style, I'm also on the American Guild of Organists supply keyboard list. The placement guy added me very quickly and I've received several friendly, welcoming emails from him and the chapter dean! Very different from experience in Former City. Getting some Sunday, Saturday evening gigs may lead to meeting some fun people and learning interesting music. 5. Detention: uh huh... If you were supposed to report for detention today, what would be the note on the slip? Student for life here; I love being on campus, and as greedy as I am about learning, I'm not crazy about more formal virtual school. I took an online class in Cascading Style Sheets a few springs ago, so I know. However, we had mandatory chat once a week, and I enjoyed those interactions, especially since I sort of knew some of the other students from real life. RevGals just want to have fun! What’s your favorite way to unwind? 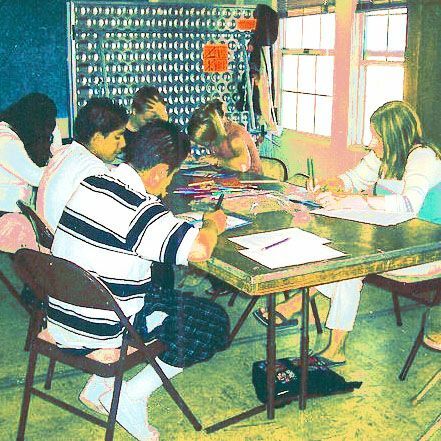 From summer 2008, here's my teaching edge. I LOVE teaching middle school age, so not surprisingly, I like teaching confirmation. I taught VBS during summers 2013 and 2014, but don't have pics of myself from either of those years, since I took most of the pics—and blogged some of them here. I've been enjoying walking through the Westwood neighborhood, and I'm looking forward to moving to the very exciting, noisy, colorful section of Korea Town, K-Town – next week. I've been grazing through the close to 9,000 local meetups, and hope to take in a few fun ones, and maybe a couple related to writing or art. You gotta love a person who loves teaching middle school kids! I'm with RevAli - people who enjoy middle schoolers are a gift for the rest of us! I should probably go through and clean up my blog. I am sure there's missing links all over the place!! Oh, and I'm jealous of anyone who can play the organ. Keeping hands AND feet coordinated is too much for me!!! thanks for visiting! I enjoy teaching adults and HS, too, but please, no one under 4th grade. Happily, there are lots and LOTS of people who love and do ery well with little kids. @Deb: hands and feet together is a slightly more complex version of learning to ride a bike: you practice and in time you can do it.